of contemporary information exchange. Ropey garlands of lazy language take their time with articulation and suggest that our continual quest for instant information gratification might in fact produce nothing more than nonsense. And maybe that really isn’t so bad. Katie Lewis studied art and art history at Dartmouth College and NYU’s Institute of Fine Arts before completing her MFA at the California Institute of the Arts in 2005. 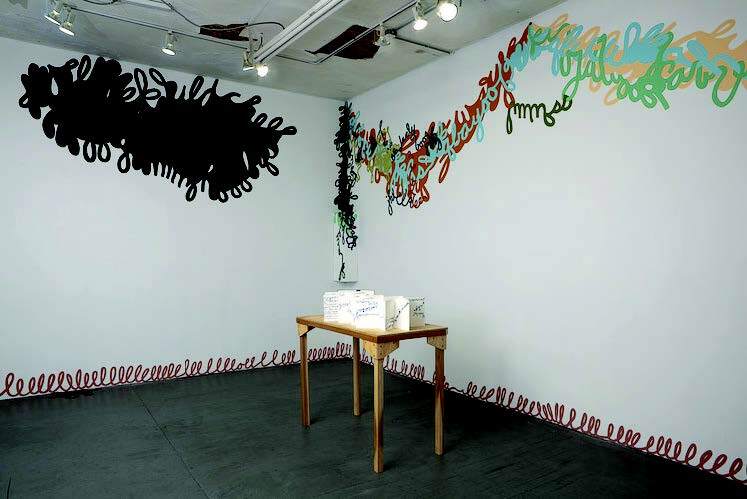 She has exhibited her work at numerous venues in Los Angeles, such as 507 Rose, Harvey Levine Gallery, and JAIL. Her paintings were also included in the 2005 Greater L.A. exhibition at Cal State Long Beach and featured in an episode of the hit HBO series Entourage in the fall of 2008. In addition to painting, Lewis also writes about art occasionally and teaches in the art program at CalArts.